JTB Group, Japan's largest travel agency, through JTB Sunrise Tours, its tour brand dedicated to bringing foreign tourists to Japan, has launched sales of a brand-new bus tour plan that invites foreign visitors to experience the majestic nature and rich Japanese culture of central Hokkaido, a favorite destination of tourists to Japan. This conveniently designed tour departs from Sapporo Station in Sapporo, Hokkaido's urban capital, and takes visitors on a 2 days and 1 night all-bus-travel plan before returning them once again to Sapporo Station. Guests will stay at the Meitounoyado Park Hotel Miyabitei located in central Noboribetsu Hot Springs, Hokkaido's most famous hot springs resort area which is immensely popular even among Japanese people. Visitors have access to hot springs with many benefits as well as the nearby River Oyunuma Natural Footbath, a rare natural hot spring river footbath. This plan has been carefully designed to deliver the breathtaking nature and rich Japanese culture of central Hokkaido to visitors in a single trip. An English-speaking tour-guide interpreter will accompany guests to ease and disencumber English speaking visitors from any concerns over the language barrier. Experience kayaking on Lake Shikotsu, boasting an unparalleled water quality in Japan with water so clear that the lake bottom can be seen from the surface. Take a trip to Showa-shinzan, a volcano in the Toya Caldera and Usu Volcano Global Geopark, accredited as a UNESCO World Geopark. 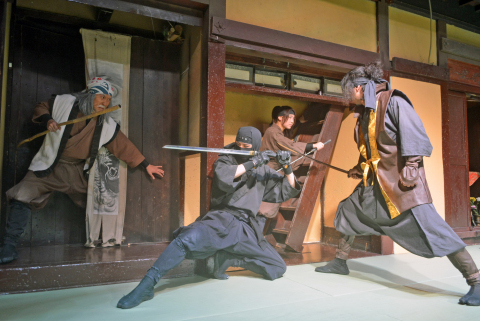 Visit Noboribetsu Date Jidaimura, a historical theme park that recreates an Edo Period village to watch exciting Ninja and Oiran concubine themed shows. Visit the Date Reimei-Kan swordsmith forge to see a master swordsmith ('katana-kaji') craft a Japanese sword. “Noboribetsu Hot Springs (aka. Noboribetsu Onsen) has been healing the body and souls of innumerable visitors with bountiful and diverse springs, even by Hokkaido standards. Powerful expressions of nature in every season set this spa area apart from others. These include Jigoku-Dani (Hell Valley), whose subtle boiling sounds can still be heard today; Oyunuma Pond, a gourd-shaped water mass with a circumference of about 1 km formed by an explosion crater at Mount Kuttara; and the River Oyunuma Natural Footbath, a hot spring river that meanders through lush nature. Reservations can be made on JTB Group's tour reservation website JAPANiCAN.com, where visitors can also book tours, hotels and ryokans throughout Japan. 1: "Noboribetsu Jigoku Festival," "Noboribetsu Onsen Hot Spring Festival," and "Demons' Fireworks in Hell Valley" are not included in this tour plan.